In this little corner: My Birthday Today! Yes!!! Today is my B-I-R-T-H-D-A-Y!! It may seem silly to publish it everywhere, to scream it from the rooftops... but for the past 5 years every birthday has a special meaning, every birthday is THE birthday. Every birthday means that I have made it another year. You see, 5 years ago I was diagnosed with Kidney Cancer. And I SURVIVED! I am still alive. With some aches and pains, but ALIVE! And this is the best birthday present anyone could ask for. Another year to love, laugh, cry and to create memories with those I love the most and who love me. 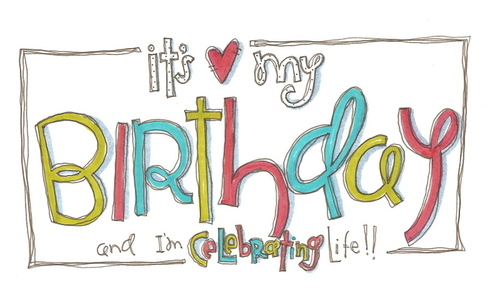 Another year to celebrate LIFE!